When you call or visit you’ll get to speak with Donna. She’ll greet you at the front desk and help you complete the registration process. If you’re interested in a complementary consultation, she’s happy to help set you up with that as well. Complimentary Consultation: We welcome you to step in for a free consultation anytime. There is no cost involved in meeting Dr. Kowalczuk and learning if we can be of help. “After meeting us and looking at the facility, it’s up to you to decide if this is the right place for you. Exam and X-rays: Ready to begin care? We’ll do a test, computerized assessment and X-rays if needed (we avoid X-rays for children under the age of 10). The consultation, exam and all tests are included for one affordable price so we can get the clearest look into your health before beginning care. Adjustment: On your first visit you can expect to be adjusted. 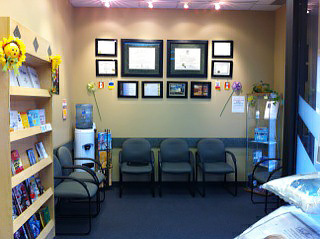 We’ll do your adjustment in a comfortable, private room and make sure all of your questions are answered. This visit usually lasts a little over an hour. Relation of Findings: We’ll discuss what your tests, X-rays and exam showed us about your health. Then, we’ll discuss your options for care and guide you towards your healing potential. Ultimately, our goal is to go far beyond your pain relief to a life of greatness. This visit lasts for 15-20 minutes and typical visits usually last less than 15 minutes.